Armed with a length of thin wire, a sharp knife, and a couple of Styrofoam coolers, Seiichi Yokota wends his way through the stalls of the century-old Dory Fleet fish market in Newport Beach, searching for live rockfish and spiny lobster pulled from the water hours earlier. It’s early morning, but the market is already buzzing with fishermen selling their daily catch. Yokota and his six-year-old company, Yokose Seafood, are on a mission: harvest Southern California’s best seafood using an advanced Japanese technique known as ikejime, which he believes yields fresher and tastier fish. Think of ikejime as a kind of kosher butchering for seafood. Running a needle threaded with wire down the fish’s spine, Yokota disables the central nervous system, which delays rigor mortis. He then quickly slits the gills with his knife to drain the blood before it begins to stagnate. The result? Fish that is more tender and flavorful and stays fresh much longer than what is at the supermarket. He says ikejime is the secret to phenomenal fish in Japan, but aside from a few sushi chefs, the technique isn’t commonly practiced stateside. Yokota wants to change that. “I feel if I am using my technique and if I can get live and local fish, I can have success,” he says. A seventh-generation fish merchant, Yokota grew up in Toyama, Japan, and trained at Tokyo’s famed Tsukiji Fish Market. He moved to L.A. in 2011 to launch a branch of his family’s 150-year-old wholesale operation. 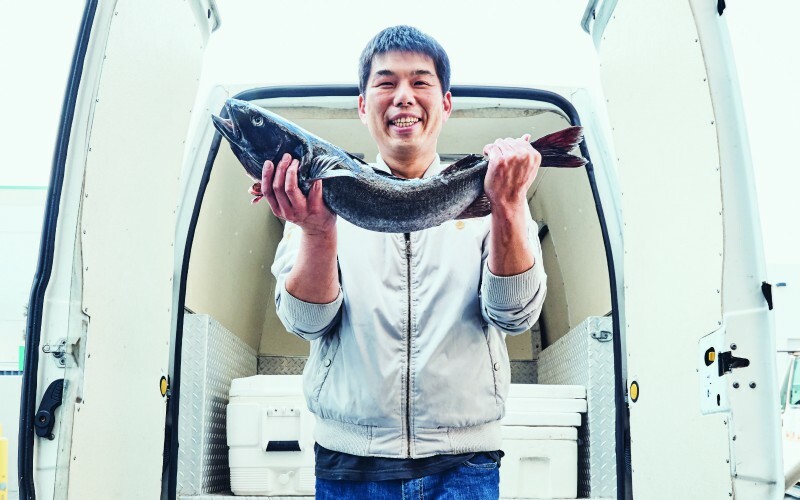 Soft-spoken but driven, he showed up unannounced at Spago one morning, cooler full of fish, and chef de cuisine Tetsu Yahagi came away so impressed by the black cod that he now takes delivery two to three times a week. Yokota also sells to n/naka in Palms and to Giorgio Baldi and Aburiya Raku, whose chefs learned about the 42-year-old by word of mouth. Few people understand Yokota’s vision (and challenges) like chef Michael Cimarusti of Providence, a longtime champion of local seafood. Since partnering with sustainable fishing organization Dock to Dish in 2015, Cimarusti has spearheaded a movement to encourage Los Angeles chefs—and by extension, diners—to think about the bounty and variety of regional seafood in much the same way they now think of local produce. “They need to be flexible,” he says, because fish, too, has a season. Yokota hasn’t been able to stay strictly local, though, as veteran sushi chefs often prefer the reliable availability of Japanese seafood. He flies in fresh fish from Toyama and offers cheaper frozen options as well, at least for now. Looking to the future, Yokota thinks his cross-cultural experience can help expand awareness about local wild-caught seafood. He hopes to turn more Japanese patrons on to the pristine quality of California fish and plans to eventually teach young L.A. chefs how to perform the magic of ikejime themselves.